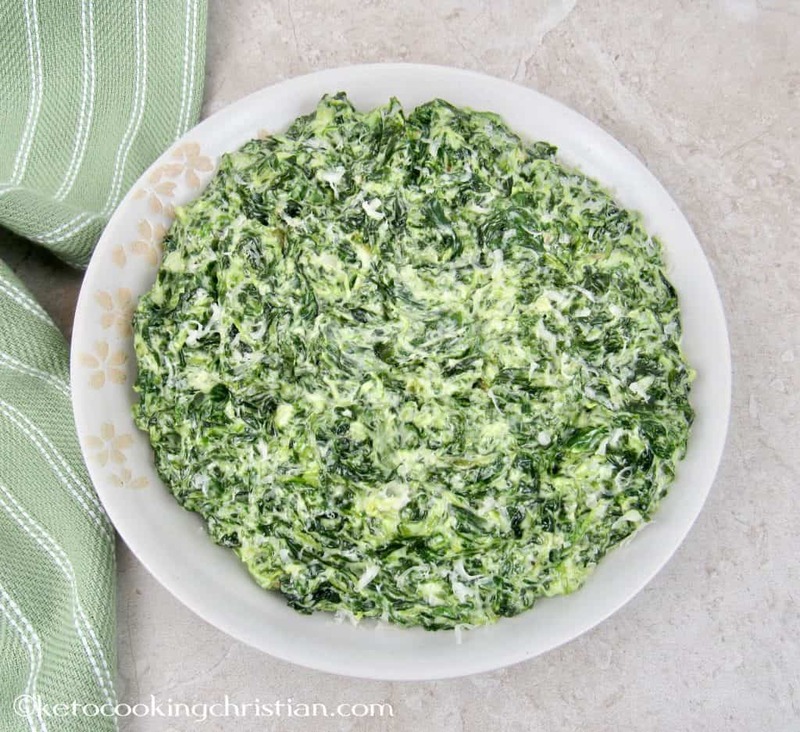 Chopped spinach in a creamy cheesy sauce makes a great side dish to go with just about any meal! 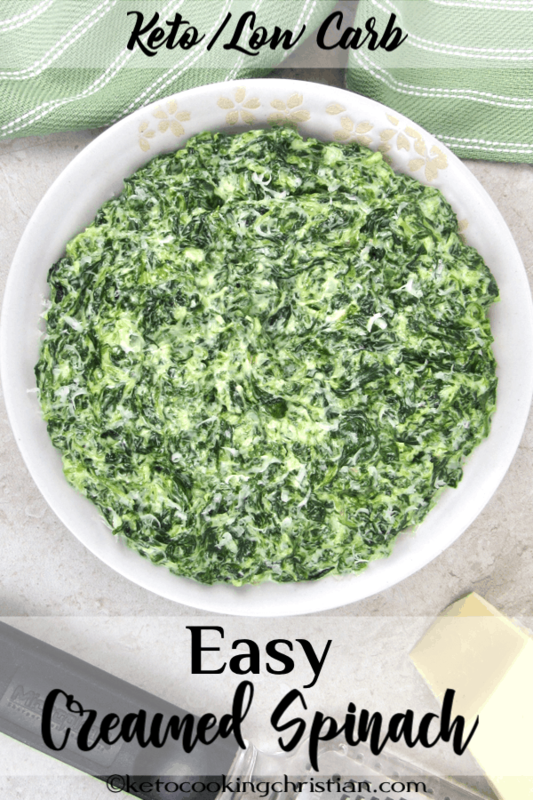 This is a quick and easy Keto side dish that is loaded with health fats! 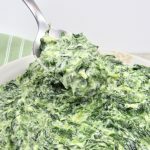 Mascarpone, cream cheese and heavy cream make this spinach super indulgent and if that wasn’t enough cheese, I also add freshly grated parmesan cheese! 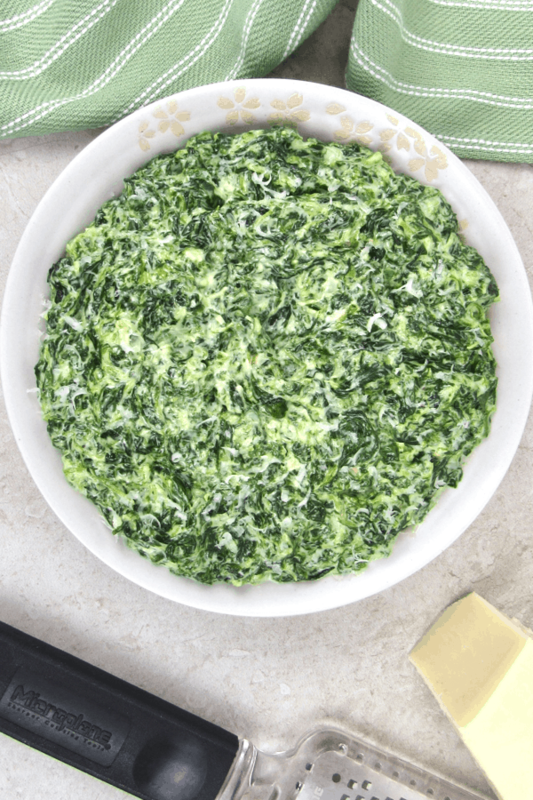 I typically make this using fresh spinach, but I decided to use frozen spinach because it’s much easier to always have on hand. I always have at least 1-2 boxes in my freezer, so I can make it anytime I want. 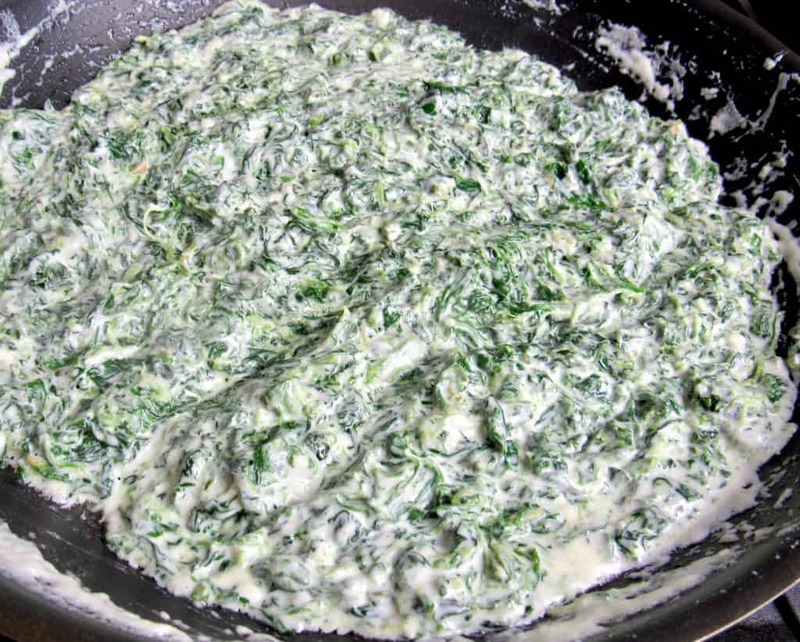 Defrost the spinach and squeeze every bit of water out that you can, making sure it is as dry as possible. 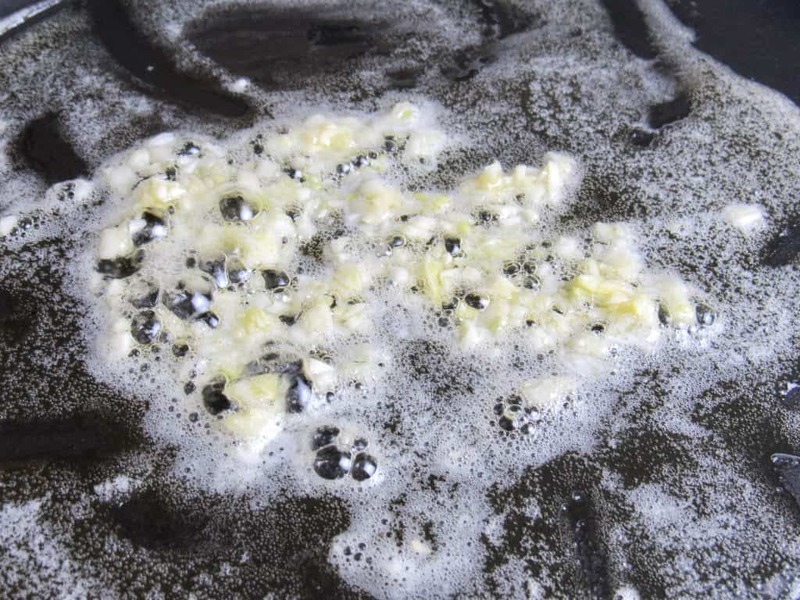 Heat a skillet over medium and sauté the garlic in the butter for about 20 seconds, careful not to burn it. 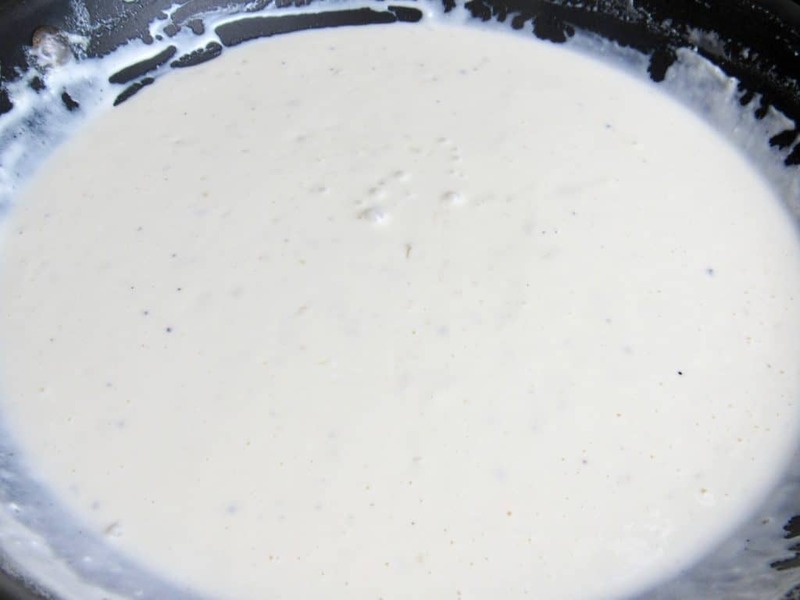 Add in the heavy cream, mascarpone, cream cheese, salt and pepper and mix until the cheese has melted. Then add in the grated asiago. Add in the spinach and simmer (uncovered) on low for 5 minutes, or until thickened to your liking. Allow to cool slightly before serving with a grating of asiago cheese over the top. Store leftovers in the fridge for a few days or freeze. Notes: I used equal parts mascarpone and cream cheese. If you don’t mind the extra carbs and want a tangier flavor, you can use all cream cheese instead. 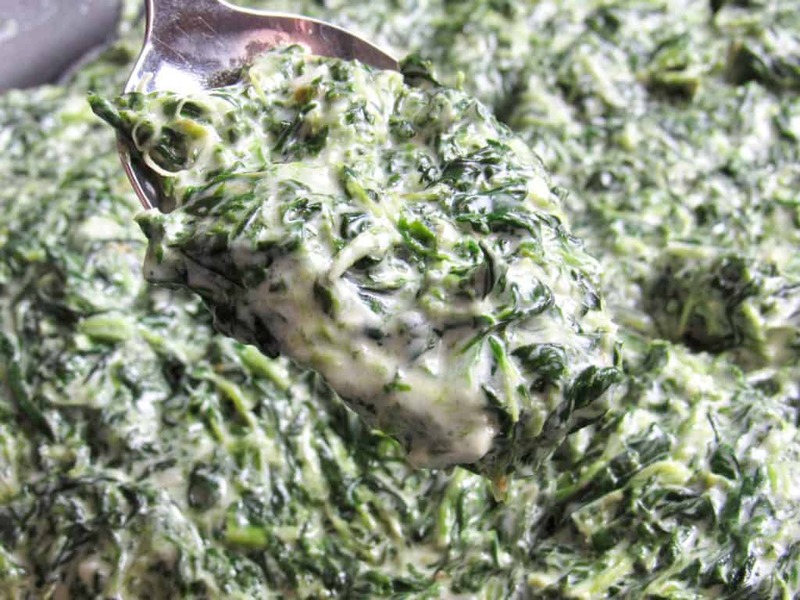 This is not a “soupy” version of creamed spinach, so if you prefer it that way, add a little more heavy cream. Be sure to add a little more salt as well. I use asiago cheese, but you can substitute with parmesan or Romano cheese if that’s what you have on hand. 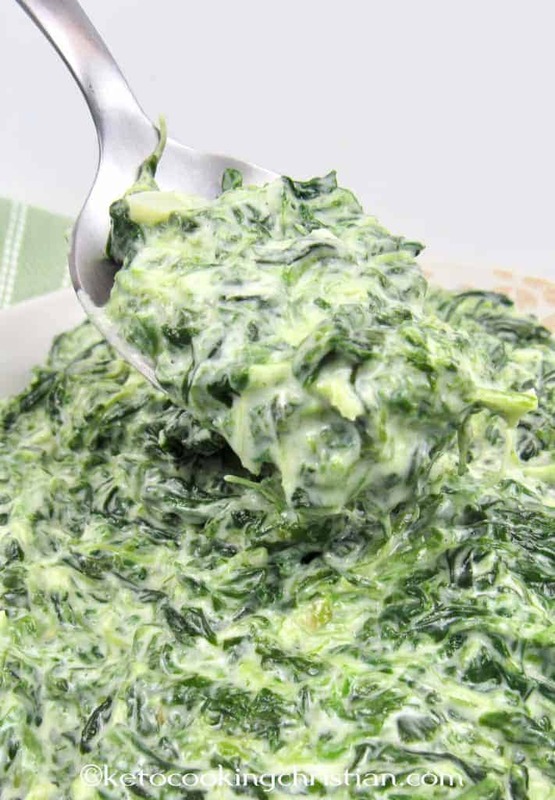 Defrost the spinach and squeeze every bit of water out that you can, making sure it is as dry as possible. Heat a skillet over medium and sauté the garlic in the butter for about 20 seconds, careful not to burn it. 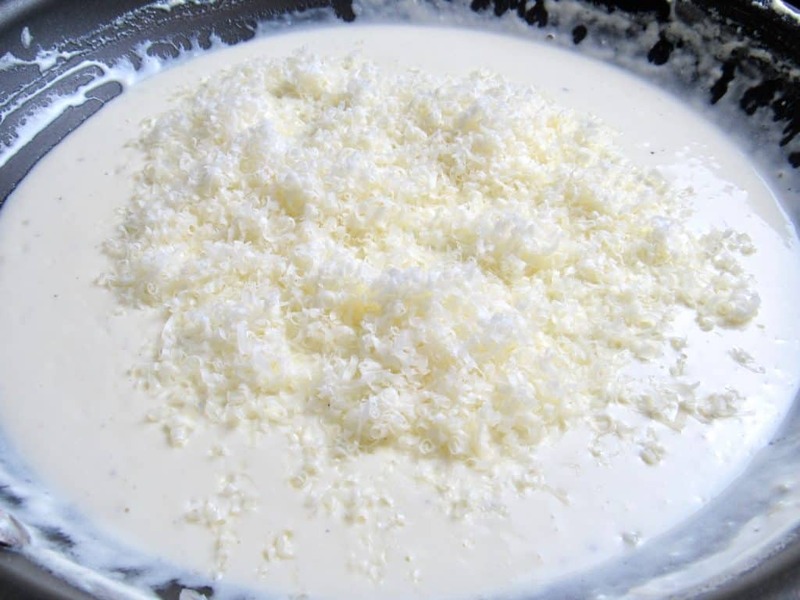 Add in the heavy cream, mascarpone, cream cheese, salt and pepper and mix until the cheese has melted. Then add in the grated asiago. Add in the spinach and simmer (uncovered) on low for 5 minutes, or until thickened to your liking. I used equal parts mascarpone and cream cheese. If you don't mind the extra carbs and want a tangier flavor, you can use all cream cheese instead. 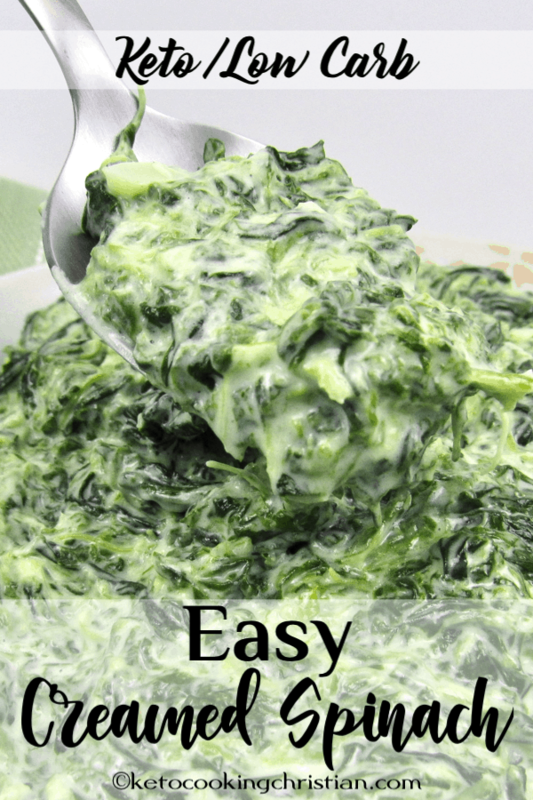 This is not a "soupy" version of creamed spinach, so if you prefer it that way, add a little more heavy cream. Be sure to add a little more salt as well. I use asiago cheese, but you can substitute with parmesan or Romano cheese if that's what you have on hand. 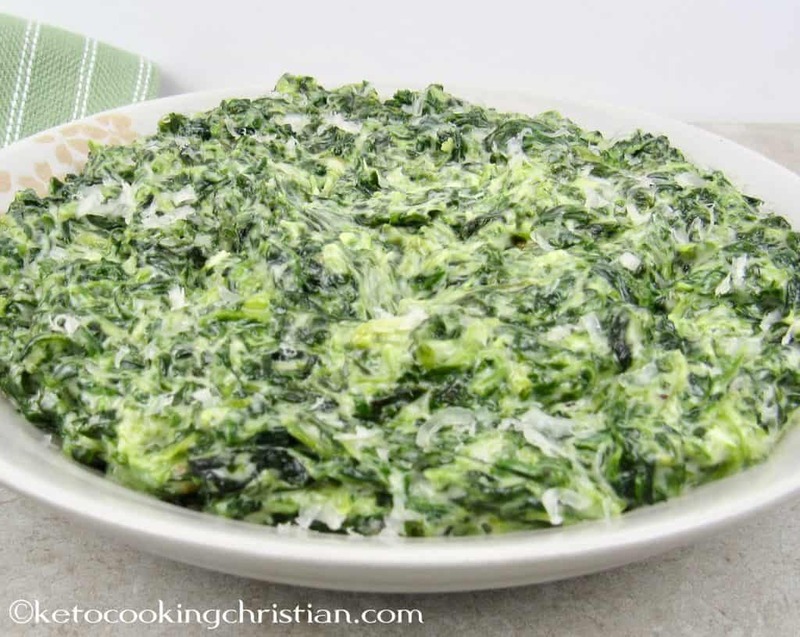 Hello Keto Cooking Christian, wondering how I can make this using fresh spinach? Will I start with the garlic and spinach first? I would actually sauté the spinach before the garlic, add it in batches as the spinach wilts. 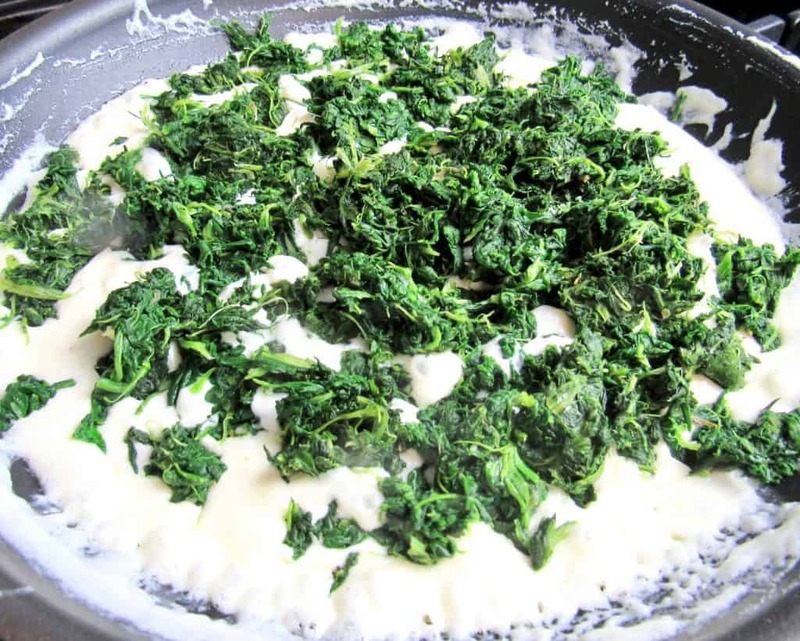 Once all the spinach has been added, remove any excess liquid then make a well in the center of the pan, add in a little butter and sauté the garlic. Then continue with the rest of the recipe. I hope that helps you and if you do make it, please let me know how it turns out! Thank you, I’ll be sure to do that!